What M.’s bungalow looked like when she bought it in January of this year. The green X’s alert firefighters that the house is unoccupied. …and how it looked last week, with a ‘rough coat’ of stucco. THIS WORK-IN-PROGRESS, an early 20th century bungalow in Far Rockaway, N.Y. — one of perhaps 450 remaining of a colony that once numbered thousands — is owned by a woman after my own heart. A longtime reader of my blog, she e-mailed me recently in response to my plea for blog-worthy ideas when my creative well had run temporarily dry. 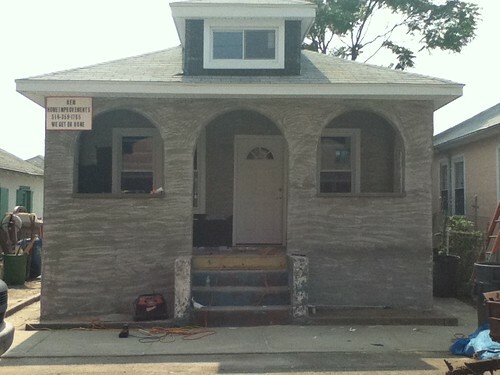 M., who prefers to remain anonymous, told me she had purchased (coincidentally — not because of my blog) one of the bungalows pictured in a post I did last summer about the bungalows of Rockaway — “the most derelict one” — and was in the process of fixing it up. I was immediately dying to find out more about this woman who had the nerve to buy a falling-apart bungalow in the far reaches of the borough of Queens, albeit 1/2 block from the ocean. This afternoon, M. and I had a long phone chat. We soon found we were kindred spirits on a number of levels. A college professor with a grown son, now single, she has been “buying properties that are a mess, fixing them up, and selling them” for 15 years, including two apartments on the Upper West Side and a couple in Park Slope, Brooklyn. 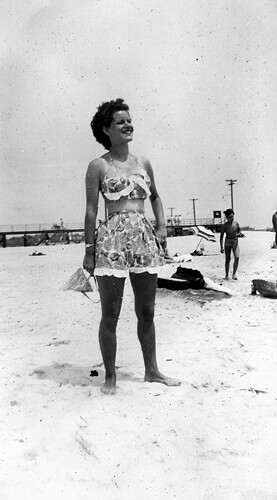 Like me, M. has fond memories of Far Rockaway in the 1950s, when she spent time there in a bungalow owned by her grandparents. I’m going to let M. tell you about it in her own words. 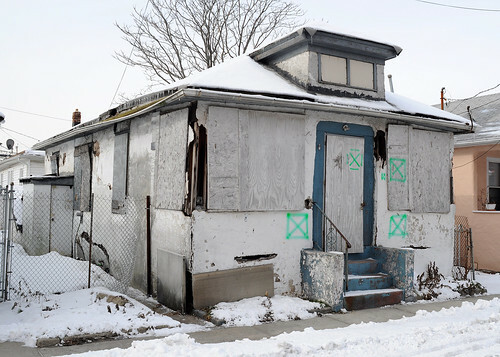 casaCARA: What on earth possessed you to buy a derelict cottage in Far Rockaway? A couple of years ago, summer in a Brooklyn apartment started to get to me. I felt caged and claustrophobic. As a college professor, I’m supposed to be writing in the summertime. I thought of buying a place in Massachusetts and got close to doing so, but backed off because the commute didn’t appeal to me, and I don’t own a car. Then it came to me. I remembered that my grandparents owned a bungalow in Far Rockaway that my mother never tired of talking about. They bought it in the 1930s. They were a large Italian immigrant family with 11 kids. They lived in East Harlem and did not have the money to buy a house, but they could scrape together the money for one of those little bungalows. This got the kids out of the city for the summer. The older ones watched the younger, and my grandparents came on weekends. I got this brainstorm to find my grandparents’ bungalow and buy it. Turns out it doesn’t exist anymore. I stumbled on the website of the Beachside Bungalow Preservation Association of Far Rockaway and emailed Richard George, a pioneer in the area. I give him a lot of credit. Without him, all of this might have been lost. I said I was interested in buying a bungalow to work in as a writer’s retreat. I figured I would put heat in and also use it in the winter. I asked him to tell me which realtors sell the bungalows, and he said, ‘It doesn’t work that way. Come on out and let’s talk.’ I did that in September 2009, and finally closed on a bungalow in January 2011. It’s all word of mouth; nothing is listed. Some were in foreclosure, and I bid but lost out. Finally, through word of mouth, came this particular bungalow. The sellers’ grandparents had owned it and it hadn’t been lived in for over 5 years. They suddenly decided to sell and Richard George let them know I was looking. They wanted $65,000 cash; they didn’t negotiate. It had to be all-cash because of the condition; it would have been impossible to get a mortgage. 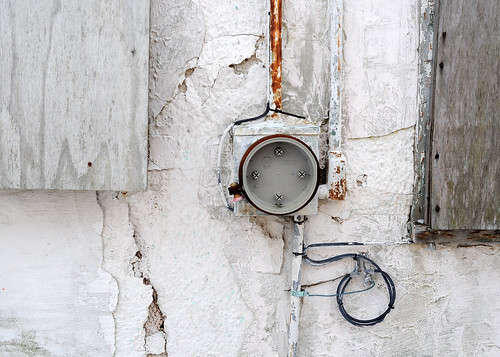 There was no electric — the meter had been stolen — and no water. Raccoons were living in the attic, and feral cats inside the house. It was just sitting there rotting. The yard was an eyesore; people had been using it as a dumping ground. Let’s backtrack a bit. What was your reaction when you first saw the neighborhood? The first time I went out was in mid-September ’09. It was a beautiful day, and that helped. I walked three blocks from the A train stop at Beach 25th Street. The only person I saw was a crossing guard, but I walked through what seemed to be a well-tended middle-class neighborhood and saw signs of active gardening, which encouraged me. I felt, I’ve got to do this, or a piece of New York history will be gone. I felt my family history going down the drain. A great-great-grandfather of mine was Matthew Perry, Commandant of the Navy. He lived at the Brooklyn Navy Yard [in buildings that have deteriorated beyond salvation]. There was this family attachment and my love for restoration, and the importance of these historical buildings and the feeling that they should be preserved. CC: When you got to the bungalows, what did you think? The one I bought was one of the worst, but after 2 years of looking, when this deal seemed like it was going to work, I didn’t feel I had a choice. If I did, I would have chosen one that wasn’t quite so derelict. It’s not a normal real estate transaction. You need an owner ready to sell at a price you can afford or to win in a foreclosure situation, which is very difficult. I felt I had to go for it. Where do things stand now with the renovation? 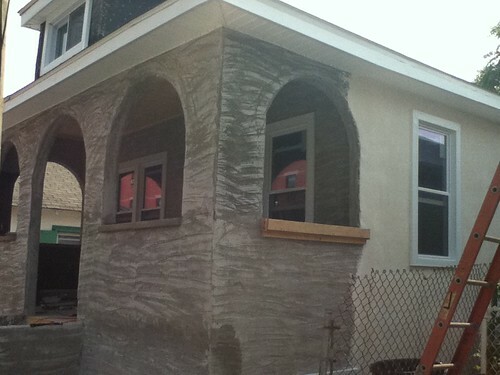 The outside’s done, the stucco’s on, and I’m coming down the home stretch. The porch had to have new footings. There’s a new roof, new windows, new electric. It’s a wood frame structure, and the walls behind the stucco were actually good. I found a local contractor. 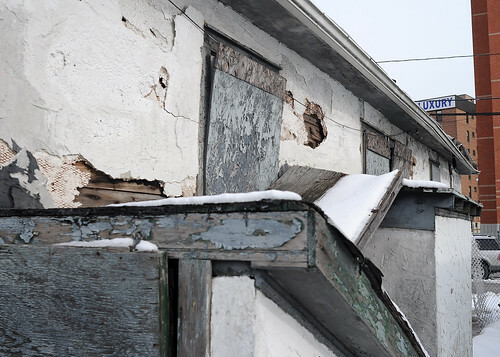 We had to get plans, an engineer’s report, and have an asbestos inspection – 24 samples. Fortunately, the place was asbestos-free. I didn’t move walls or raise ceilings. It remains to be seen if the wood floors can be saved. I wasn’t able to salvage anything from the kitchen or bath. This is one of the larger bungalows at 700 square feet, all on one level, with three small bedrooms to the left of the front door, and a living room, kitchen, and bathroom to the right. Some of them are smaller, and so close together you can reach out the window and hand someone a cup of sugar in the next house. But this one came with a side lot which has a public easement. I’m going to do some IKEA, paint the ceiling light blue, and do ’50s wallpaper in the bathroom and one of the bedrooms. And the final renovation budget? Right now, to tell you the truth, I don’t know. It’s still not done, and the plumbers are a big question mark. I was going to spend $50,000 and it looks like I’ll be close or slightly over. Have you seen changes in the neighborhood in the past two years? A few bungalows have turned over, but it’s not a sea change. There are quite a few left intact on Beach 24th and Beach 25th Streets that make a sort of colony on the ocean. Others are piecemeal, a couple here and there, some next to 1970s houses. There are some bungalows that have mortgages of $300-400,000. There was a lot of mortgage fraud out there. You can see the mortgage balances on Property Shark. They’ll be coming up as foreclosures, but they’re not available now. The white section on the right is new stucco, applied over wire mesh. M. hopes to be in her bungalow by August 1st. After the first stressful months of renovation, she’s feeling very positive, as well she should. I felt immediately I wanted to do this: ‘A little place that won’t overwhelm me, that I can maintain. It’s adorable, it’s historic, it’s exactly right.’ Then came the difficulty of actually doing it. But given what I started with, the transformation is way better than I ever imagined. This entry was posted in COTTAGE LIVING, HISTORIC PRESERVATION, OLD-HOUSE MAKEOVERS, QUEENS, REAL ESTATE/INVESTING, RENOVATION and tagged A train, Beach 24th, Beach 25th, Beachside Bungalow Preservation Association, Brooklyn Navy Yard, bungalow, bungalow colony, cottage, Far Rockaway, foreclosure, Matthew Perry, mortgage fraud, Park Slope, preservation, Queens, renovation, Richard George, Rockaway, stucco, wood frame. Bookmark the permalink. I am so excited to see this post. I spent many summers with my friends at Far Rockaway. My dad went to Far Rockaway HS and many of my friends went to Stella Maris HS. A treasured family photo from 1924 depicts my 89 year old mom and her twin brother sitting on the porch of a bungalow about a block from M’s new place. I grew up in Howard Beach, near the Rockaways and used to visit friends there who had a bungalow when I was a kid– in the late 1960’s and 70’s. M’s story makes me want to go out and follow her lead! How exciting! I’m a seasoned renovator and I’m not sure I would have taken this on. But it’s like they say “Location, Location, Location.” It sounds like “M” was familiar with the area and did her homework. You GO GIRL! Wow! Fascinating. You seem to have gotten a lot for your renovation money. We planned to spend $30,000, spent $60,000 and didn’t seem to get much beyond a nice electrical upgrade. Everything else either wasn’t done or has to be done over. Did you manage the get the cats and raccoons out — by redoing the exterior and sealing any holes? Was the house originally wood siding or stucco? I love the sound of 50s wallpaper. How perfect for this bungalow. Good luck with your new home. Absolutely loved this post! There was just an article in the NYT that said that Rockaway Beach boardwalk is becoming the new Bedford of Williamsburg. I think soon we will see more change coming to the Rockaways. Lovely bungalow indeed. Please follow up with Cara to post the final after product. I was born in Far Rockaway in 1942 in what was then called St. Joseph’s Hospital. My dad owned a grocery on B. 28th street . I spent the first 16 summers of my life there . I was contemplating buying a bungalow because the happiest times of my life were at Rockaway Beach and it constantly called to me, I felt it was where I belonged. My sons live in CA and as I aged they wanted me to move near them, because I have no other family. So that’s what I did, but my heart will always be in a Rockaway Beach Bungalow. Great post. I hate to think what Sandy might have done to this home. How did it hold up? It suffered some damage, Alex. In the basement only – the owner had to replace the hot water heater for sure and possibly the boiler too (a very short time after putting them in). FEMA paid for it.